Order Ecoforce Dish Brush Refills - recycled from the Online Health Food Store UK. Buy Ecoforce Recycled Spare Brush Heads x 2 and other quality Homeware safely online in the UK. Replacement Brush Heads for your EcoForce Dish Brush. This brush head fits EcoForce and Dishmatic Handles and is made from 70% recycled materials. Less plastic. Replacement Brush Heads for your EcoForce Dish Brush. This brush head fits EcoForce and Dishmatic Handles and is made from 70% recycled materials. You'll be using less plastic, by using these replaceable dish brushes! Our UK Health Shop sells real Ecoforce and other Homeware from top-quality brands safely online to customers throughout the United Kingdom in England, Wales, Scotland and Northern-Ireland. View more products on the Online Health Food Store from Ecoforce. Where to buy Ecoforce Dish Brush Refills - recycled safely online? Shop at the Online Health Food Store if you are wondering where you can buy Ecoforce Recycled Spare Brush Heads x 2 safely online in the United Kingdom. Our Health Shop is located in the UK and our award-winning independent has been serving customers in England, Wales, Scotland and Northern-Ireland since 1976. You can buy our Homeware online and we post out orders to any UK address. 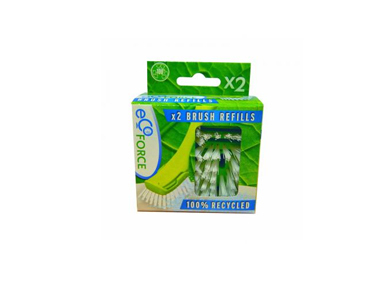 Dish Brush Refills - recycled - Ecoforce Recycled Spare Brush Heads x 2 in Homeware and Household.